More than a third of local jurisdictions reported using "placemaking" as an economic development strategy in 2013, up from 21 percent in 2009, according to the latest Center for Local, State, and Urban Policy poll. Placemaking is a community and economic development strategy that attempts to capitalize on local assets to create appealing and unique places where people want to live, work and play. 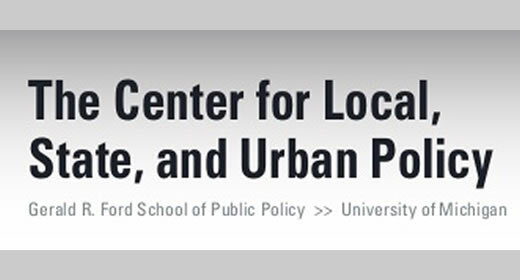 "In placemaking, communities use what they have whether it's arts, cultural amenities, parks, architectural design, lakes or walkable streets to create a strong bond between people and the places they live," said Tom Ivacko, administrator and program manager for the Ford School's Center for Local, State, and Urban Policy. Fifty-one percent of Michigan's local leaders say they believe placemaking can be effective in their jurisdictions, compared to 39 percent who reported confidence in placemaking's effectiveness in 2009. Local leaders see links between placemaking and entrepreneurship, but say they face barriers to attracting more entrepreneurs, including access to capital (72 percent), unappealing buildings and landscape design (29 percent), deteriorating infrastructure (27 percent), lack of late night entertainment (26 percent) and information technology infrastructure (21 percent). Jurisdictions in Southeast Michigan (55 percent) were the most likely to pursue placemaking in 2013, followed by those in the Upper Peninsula (37 percent), the Northern Lower Peninsula (33 percent), the Southwest and West Central Lower Peninsula (each at 29 percent), and the East Central Lower Peninsula (25 percent). Proponents of place-based economic development argue that by creating vibrant downtowns, neighborhoods or public spaces, and improving a community's quality of life, talented workers will be drawn to move there, and they will attract new businesses as well as start their own. "The Michigan Municipal League has long advocated placemaking as an essential economic driver for the state," said Daniel Gilmartin, CEO and executive director of the MML. "These survey results prove that local government leaders not only increasingly talk the placemaking talk, but that they also walk the placemaking walk. More and more of them believe in placemaking and are doing placemaking in their communities." CLOSUP launched the MPPS survey program in partnership with Michigan's local government associations—Michigan Association of Counties, Michigan Municipal League and Michigan Townships Association, who connect CLOSUP with their members and consult on survey topics. CLOSUP makes all decisions on questionnaire design, data analysis and reporting, and funds the program itself, Ivacko said. Deena Bosworth, director of governmental affairs for the Michigan Association of Counties, said counties across the state have unique characteristics and resources to offer both businesses and individuals. "By partnering with our local units of government, we can help to achieve the placemaking goals we are all striving for," she said. "Not only will working together enhance communities across the state, but it will help to fuel Michigan's economic future." Larry Merrill, executive director of the Michigan Townships Association, said that townships are encouraged to adopt placemaking efforts that capitalize on their specific assets or unique identities, while also supporting regional placemaking strategies. "When placemaking strategies influence local land use decisions, highly intensive economic development is encouraged to locate in established commercial and industrial centers and rural communities focus on preserving their natural resources, beautiful vistas and family friendly amenities," Merrill said. The study, conducted in April-June 2013, involved surveys sent via hard copy and the Internet to top elected and appointed officials in all counties, cities, villages and townships in Michigan. A total of 1,350 jurisdictions returned valid surveys, resulting in a 73-percent response rate. The survey had a margin of error of 1.4 percentage points either way.